The Chrome extension Shortcuts for Google allows you to add and display all Google services within 1 space saving button. 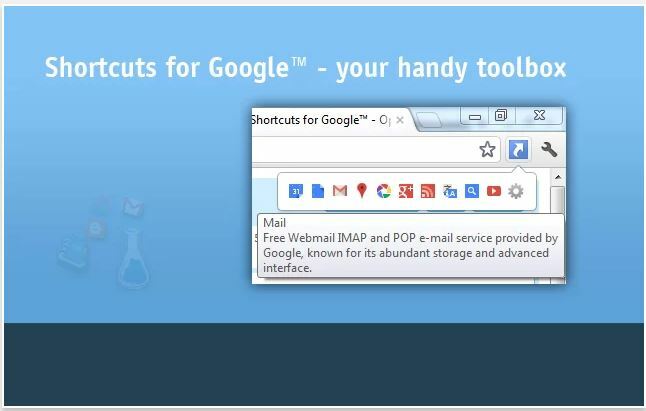 Choose from 160+ Google services such as Gmail, Google Reader, Google Maps, Google Calendar, Google Drive, YouTube, etc. Click here to get it from Google’s Web Store. Classroom Integration: Any schools use Google Chrome as a web browser and/or using Google Chromebooks could benefit with using Shortcuts for Google. Here are ways using this extension can help you and your students. Consolidate all the Google services you want your students to use all in 1 button. Teach students organization and customization of their web browsing experience. Teachers can be better organized with an all in 1 button on their browser. Only add the services you want your students to use for your class. In an all in 1 button staff as well as students will not get lost in the clutter of numerous extensions.